When running a query on a table in Access using a Data Source ODBC, users may periodically get an ODBC error: "ORA-01013 User Requested Cancel of Current Operation." when the user did not cancel the query. Click Start > Settings >Control Panel > Administrative Tools > Data Sources (ODBC). Click the "System DSN" tab in the ODBC Data Source Administrator Window. Select the name of the Banner/Oracle data source from the list. 5. 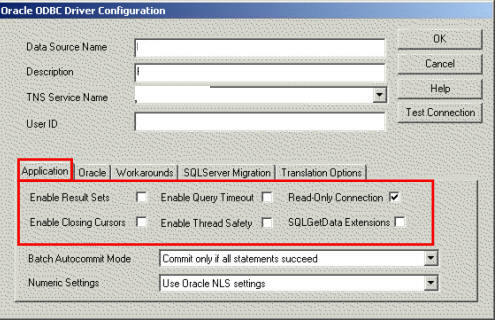 On the Application tab of the Oracle ODBC Driver Configuration window, un-check all checkboxes with the exception of Read-Only Connection (refer to Figure 1). 6. 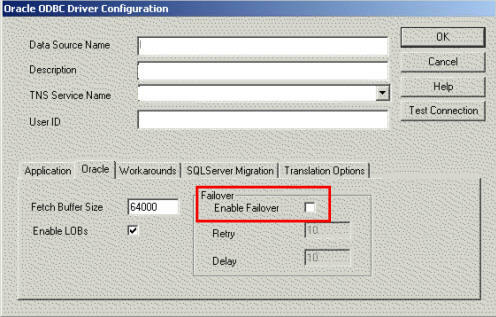 On the Oracle tab of the Oracle ODBC Driver Configuration window, un-check the checkbox for Enable Failover (refer to Figure 2).